What Does It Take To See It? In fact, by one definition the Outback is most of the country. OK -- If you're planning a trip to Australia, and you want to see some of the Outback, you don't want this big generalized definition. You want to know where to go and what to see. Because much of the continent is so dry, most of the population in Australia lives along the coasts. The east coast is the most populated. A fair number of people also live along the west coast. There are wineries there too. All the rest of the country... the part that is less populated... is considered the Australian Outback. It's known to many as Ayers Rock, but it's proper name among the Aboriginal native population is Uluru. Uluru is where we went, so that's what we'll tell you about. You could drive to Ayers Rock, then you'd really get a taste for the Australian Outback. 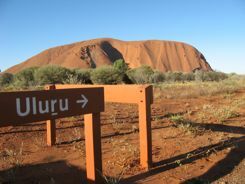 ...or in the Red Center... however you choose to describe its remote location, visiting Uluru is well worth the effort. We think the way to go is the way we went. Fly in. You can join a tour or travel independently. We rented a car... that's often our first choice. Rental cars are expensive around Uluru, but so are tours. You are pretty much limited to one or the other. The roads you will be driving on are two lane, and many of them are dirt roads, but all are well maintained. Remember, you will be driving on the left. The accommodations range from five star hotels to hostels to a camp ground. All of these are all located in Yulara which is a township/resort that is about 5 miles (8 km) from the entrance to the Uluru-Kata Tjuta National Park. 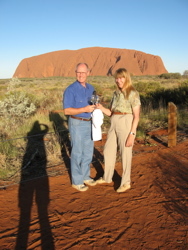 This resort area is about 11 miles or 18 km from Uluru itself. There are a variety of restaurants and snack bars and a small grocery store. Within this resort area, you can walk or take a free shuttle bus to get around. You might want to stay in one hotel, but eat at another... That's easy. You should plan to spend two or three nights to see even this small section of the Australian Outback. You will WANT to see it at various times of the day. It really is an awe inspiring sight. We did not climb Ayers Rock out of respect for the Aboriginal People's wishes. They consider it sacred, and they ask you not to. 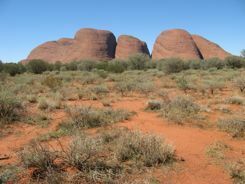 You will also want time to visit Kata Tjuta (which used to be known as the Olgas). But to really appreciate them, you should allow time for a hike. We loved the hike we took, though we do have to admit we didn't plan it as well as we could have... we went in the middle of the day when it was HOT. 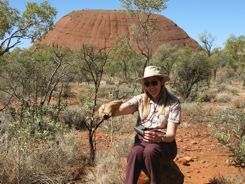 There are many areas in the Olgas that are sacred areas, and you should not hike in those. We mentioned that we didn't climb Uluru. When we were there you still could. I had always said I wanted to, but when we got there, it just didn't seem right to go against the wishes of the Aboriginal People. Uluru really does feel like a sacred place. All around Australia you will run into cave paintings and other types of Aboriginal Art if you look for it. We love all of that. 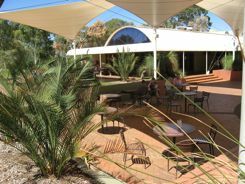 You would need to allow weeks and weeks to explore all of the Australian Outback, but you can get a great taste for how beautiful it is by just visiting the Red Center around Ayers Rock. So rather than climbing it, get yourself a bottle of Australian sparkling wine and toast to a great experience as you watch the sunset on Uluru. Travel doesn't get much better than this!